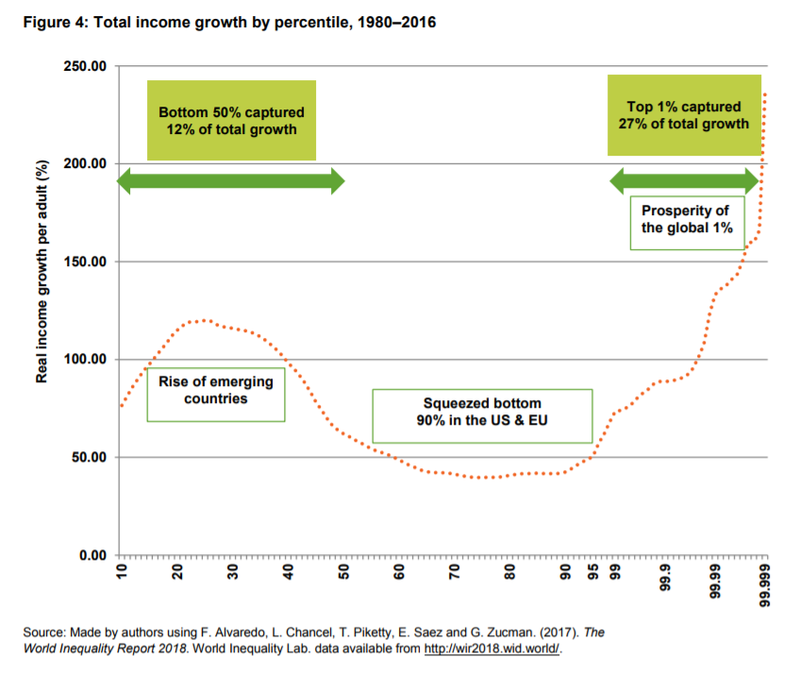 According to a new Oxfam report, 82% of the wealth generated last year went to the richest 1% of the global population, while the 3.7 billion people who make up the poorest 50% of the world saw no increase in their wealth. What happened? Eighty two percent of the wealth generated last year went to the richest 1% of the global population, while the 3.7 billion people who make up the poorest half of the world saw no increase in their wealth, according to a new Oxfam report released today. Billionaire wealth has risen by an annual average of 13% since 2010 – six times faster than the wages of ordinary workers, which have risen by a yearly average of just 2%. The number of billionaires rose at a rate of one every two days between March 2016 and March 2017. This huge increase could have ended global extreme poverty seven times over. The Oxfam report states that it takes just four days for a CEO from one of the top five global fashion brands to earn what a Bangladeshi garment worker will earn in her lifetime. In the US, it takes slightly over one working day for a CEO to earn what an ordinary worker makes in a year. Oxfam’s report outlines what it believes are the key factors driving up rewards for shareholders and business leaders at the expense of workers’ pay and conditions. These include the erosion of workers’ rights; the growing influence of business over government policy-making; and a drive to minimize costs in order to maximize returns to shareholders. Things are particularly bad for female workers. Across the world, women consistently earn less than men and are usually in the lowest paid and least secure forms of work. By comparison, 9 out of 10 billionaires are men. “Oxfam has spoken to women across the world whose lives are blighted by inequality. Women in Vietnamese garment factories who work far from home for poverty pay and don’t get to see their children for months at a time. Women working in the US poultry industry who are forced to wear nappies because they are denied toilet breaks,” said Byanyima. The report also reveals that 42 people now own the same wealth as the poorest half of humanity. 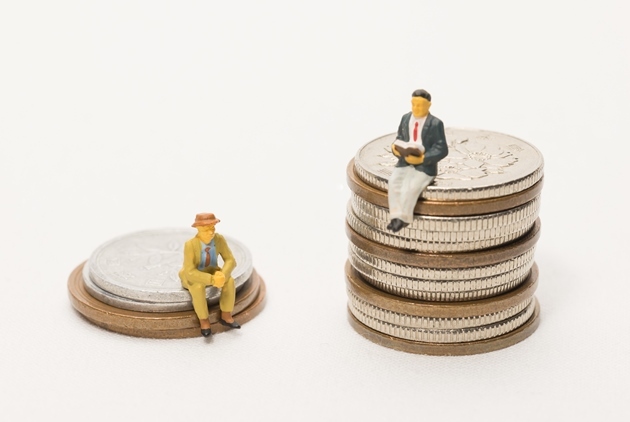 Last year, Oxfam claimed that just eight men owned the same wealth as half the world, but now uses a revised data set published by Credit Suisse. When the organization recalculated last year’s figures using the latest data it revised this 2016 statistic to 61 people, not just eight men. The report makes a number of recommendations for how we can bring this cycle of inequality to an end. "Limit returns to shareholders and top executives, and ensure all workers receive a minimum 'living' wage that would enable them to have a decent quality of life," the organization said in a statement. "Eliminate the gender pay gap and protect the rights of women workers. At current rates of change, it will take 217 years to close the gap in pay and employment opportunities between women and men. Ensure the wealthy pay their fair share of tax through higher taxes and a crackdown on tax avoidance, and increase spending on public services such as healthcare and education." "Oxfam estimates a global tax of 1.5% on billionaires' wealth could pay for every child to go to school." For this report, Oxfam surveyed over 70,000 people in 10 countries, nearly two-thirds of whom said they think the gap between rich and poor should be urgently addressed. Oxfam's report, Reward Work, Not Wealth, is available here. Original content can be found at the website of World Economic Forum. This article is reproduced under the permission of World Economic Forum (WEF) and terms of Creative Commons Attribution-NonCommercial-NoDerivs 4.0 Unported License (“CCPL”). It presents the opinion or perspective of the original author / organization, which does not represent the standpoint of CommonWealth magazine.